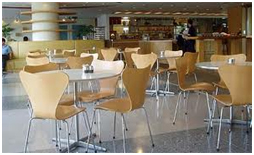 Be it the tensed exam moment or the usual lively weekdays, the canteen enjoys the proud position of being the most sought after place in and around every college campus. Fun , prank and jokes along with a feast , canteen chatting and gossips play a vital part of student life. Here in ITResearch we have a healthy and hygienic multi-cuisine vegetarian canteen facility outside the Institution premises. The canteen is spacious and the foodies are also subsidised .From Health point of view ,the overall canteen services are properly supervised by the food committee time to time.